MOSCOW — Russia’s Defence Ministry on Thursday displayed a pair of drones that it said were captured following attacks on two Russian military bases in Syria, saying the attack required know-how, indicating it was carried out with outside assistance. The Defence Ministry said Saturday’s raid on the Hemeimeem air base in the province of Lattakia and Russia’s naval facility in the port of Tartus involved 13 drones. It said seven were downed by air defense systems and the remaining six were forced to land by Russian electronic warfare units. 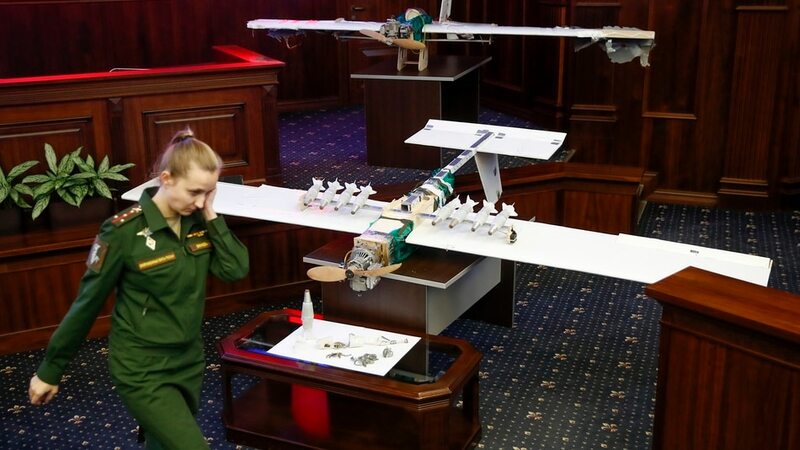 The Defence Ministry presented two primitive-looking drones at a briefing, arguing that they featured state-of-the art electronics that are less prone to jamming and allow precision strikes. Novikov didn’t blame any specific country, but the Defence Ministry earlier referred to the “strange coincidence” of a U.S. military intelligence plane allegedly barraging over the Mediterranean Sea near the Russian bases when the attack took place. The Defence Ministry said the drones were launched from al-Mouazzara in Syria’s northwestern province of Idlib, more than 30 miles away from the Russian bases. Russia has staunchly backed Syrian President Bashar Assad, and Turkey has supported his foes, but they struck a deal last year to set up de-escalation zones. The agreement has helped reduce fighting and warm ties between Moscow and Ankara. It also involved Iran, another backer of Assad. Following the drone attack, the Russian Defence Ministry sent letters to Turkey’s military leaders, asking them to deploy military observers to help prevent further attacks from Idlib on Russian assets. He added that he discussed the raid with Turkish President Recep Tayyip Erdogan earlier Thursday, voicing confidence that Turkey’s leadership and military had nothing to do with it.